Pardon me, DC folks but there is no need to trek to the Nation's capital for cherry blossoms. The BBG once again looks forward to full blooms this month. Since they blossom for such a short time, keep up to date with this map which is updated every weekday. If you can, time your visit with Sakura Matsuri, which falls on the weekend of the 27th and 28th. If Orchids are more your thing, then trek up to the New York Botanical Gardens in the Bronx for the annual Orchid Show. Stroll through the lush gardens (worth a trip up there for this alone) to the Observatory where there will be a showcase of orchids in a myriad of colours and varieties. Remember when it housed waterlilies last Autumn? Similarly, there will be evening concerts, potting classes, lectures and guided tours. The latest exhibit at the Museum at the Fashion Institute of Technology is right up my alley. 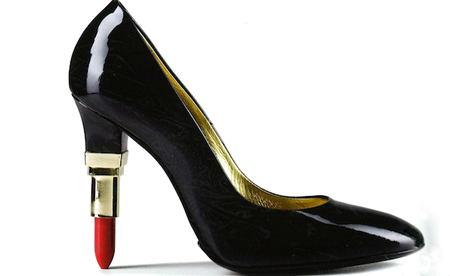 "Shoe Obsession" is a display of fabulous footwear from the the last decade, with an emphasis on the statement heel. The exhibit features over 150 designs from major fashion houses and avant garde designers. I am most looking forward to seeing pairs lent for the exhibit by Daphne Guinness and Lynn Ban. The best part, if the idea of glamorous shoes were not enough, this exhibit (and all other exhibits at this museum) are always free. Created by Robert De Niro in 2002 to revitalise lower Manhattan after 9/11, the city's largest indie film fest is once again upon us. This month's festival will feature films by acclaimed directors like Neil Jordan (Interview with the Vampire), Mira Nair (Monsoon Wedding) and David Gordon Green (Pineapple Express). There will also be a selection of documentaries on Richard Pryor, Gore Vidal and Muhammad Ali. 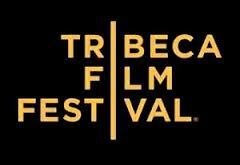 As always, there will be a post-show Q&As with filmmakers as well as panel discussions throughout the festival. Tickets are available for purchase here. Relive your childhood by taking part in a pillow fight this weekend at Washington Square Park. Bring your softest weapon of choice (no feathers or down though) to fight for charity - surviving pillows will be donated to homeless shelters post-battle. This fun event is not exclusive to NYC, so check out if your city is participating here. 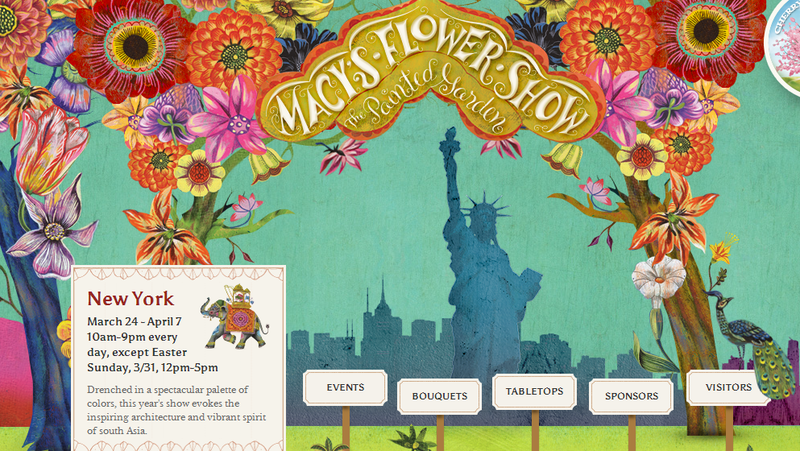 Another non-NYC exclusive event this month is the annual Macy's Flower Show. This year's Show pays homage to the colour and splendour of South Asia. Be prepared to see decorated elephants and blooms in rich jeweled tones not only in the special tent erected on Herald Square, but also all around the store adjacent to it. I live too close to not pay a visit plus it might be handy for ideas for my upcoming big fat Indian wedding? If you visit, do as I do and go early to beat the crowds. And soon - it wraps up this weekend. Flowers are the clear theme of the month in NYC. However cliched that might be, I wouldn't have it any other way. Have a lovely April! Tell me the weather is warming up? Those heels are just too awesome!! And I love the Cherry Blossom season (it already ended here) And the Pillow Fight...are you serious? I've never heard of that before but than again NY is one of the coolest and unique citifies I know!! I didn't make it out to the Pillow Fight but friends who went had a blast! those heels are beautiful! thanks for this post. I looked forward to seeing the cherry blossoms every year (for about five years) and no guy that i was dating at the time was ever keen to visit. it just seemed too romantic to visit alone. and this year, i'm single and taking myself. i figure nature is the first to really, truly love us - does company matter when we appreciate it? i mean the mona lisa doesn't care if there are 2 sets of eyes or hundreds, poring and gazing at every inch of her. all she cares about is that someone takes the time to visit her. Company is not at all necessary when surrounded by immense beauty! Frankly my man isn't the biggest fan of flowers (you should have seen his face when I dragged him to the Macy's Flower Show!). We do however share a love for all things Japanese so he plans to be by my side when we check out the cherry blossoms this year. Hope you had a splendid time at the park yourself!